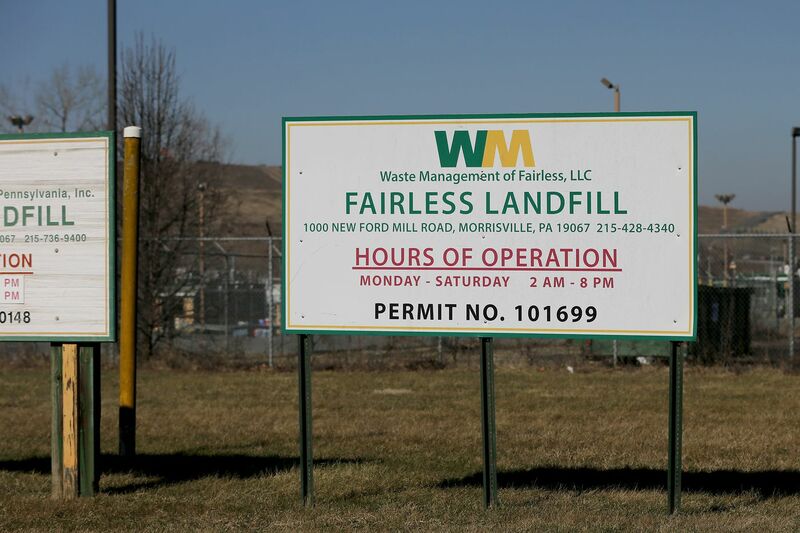 A sign sits outside the entrance to Waste Management's Fairless Landfill in Morrisville, PA on February 4, 2019. Residents in Bordentown City, N.J. have attributed a rotten egg odor to Waste Management's four landfills in lower Bucks County. Along Farnsworth Avenue in Bordentown, a riverfront city across the Delaware from Bucks County, a putrid stench hangs in the air. Residents say it smells like a rotten egg. The odor lingers over houses, playgrounds, schools, and the businesses that line its downtown streets. It is omnipresent, enveloping. Even in mild weather, neighbors close their windows to try to ward off the encroaching smell. “It’s like a garbage can in the middle of summer,” said Gus Hamdan, owner of Chez Alice delicatessen and café on Farnsworth Avenue. James Lynch, mayor of Bordentown City. “It’s a very nauseating smell," he said, adding that wind speeds determine how noxious the smell will be on any given day. Lynch and others suspect that the smell emanates from four landfills in and around Falls Township across the river in Bucks County. The stench, they believe, starts there and is carried by winds that blow east across the Pennsylvania border and into New Jersey. Officials at Waste Management, which runs the landfills, say they are investigating the source of the rank smell. The excessive rain last year — more than 66 inches in all in Bucks County — could have been a factor, said John Hambrose, a spokesperson for the company. The company only recently learned about the odor complaints, he said. “The quicker we know about it, the quicker we can make corrections if they’re needed," he added. A truck arrives at Waste Management's Fairless Landfill in Morrisville, Pa. Residents in Bordentown City, N.J., have attributed a rotten-egg odor to Waste Management's four landfills in lower Bucks County. Three of the landfills — Tullytown, GROWS Landfill, and GROWS North in Falls Township — are closed and have long been capped with a plastic lid and soil, Hambrose said. The remaining landfill, which continues to take in waste, is the Fairless Landfill on New Ford Mill Road in Falls. Hambrose said the company has carefully monitored the landfills to ensure that no gas or liquid from waste seeps out. But, he said, the deluges of rain last year complicated that work when it saturated waste and accelerated gas production. The rain also delayed routine work. Trucks move through the weigh station at Waste Management's Fairless Landfill in Morrisville. Residents in Bordentown City, N.J., have attributed a rotten-egg odor to Waste Management's four landfills in lower Bucks County. At the same time, he said, there were other possible sources of the odor wafting into New Jersey. “In any community there are many potential sites for odors," Hambrose said, and suggested that sewage plants and industrial facilities in the area might be to blame. In recent weeks, the New Jersey Department of Environmental Protection has received more than two dozen complaints about the stench from residents of Bordentown City, said Larry Hajna, a spokesperson for the DEP. There were four additional odor complaints from residents of neighboring Bordentown Township, he said, adding that the department would investigate each one. Residents, for their part, simply want something done about the stench, said Lynch, the Bordentown mayor.